Should have named him weeks ago when we first spotted Elvis but better late than never. Elvis left his nest this past week. He's been gone for a few days now but we still hear him call out from the trees. I think I saw him down on the ground behind 1 green and along the path to 17 as well. 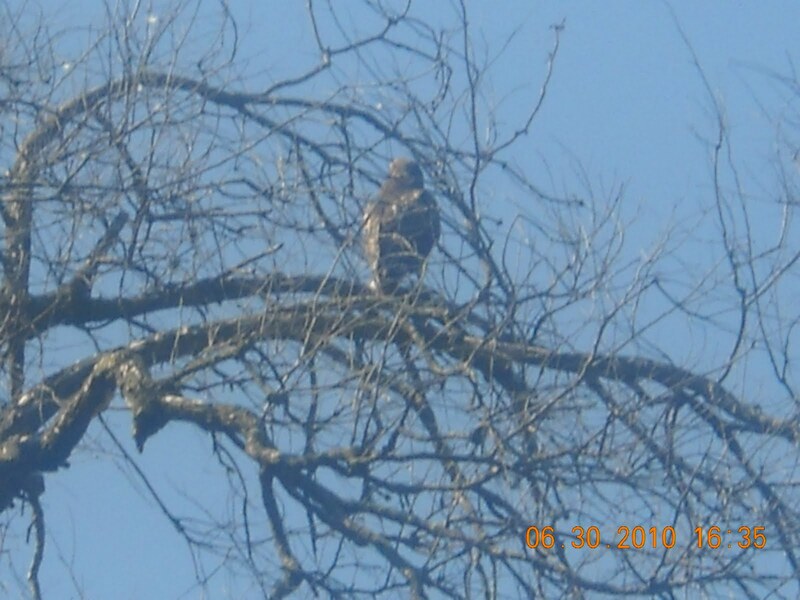 This afternoon, I caught him hanging out in the Siberian Elm on the right side of #1 green. I'm glad now we did not cut that tree down until this coming winter so he could perch on a limb and we are able to watch him experience the new world. 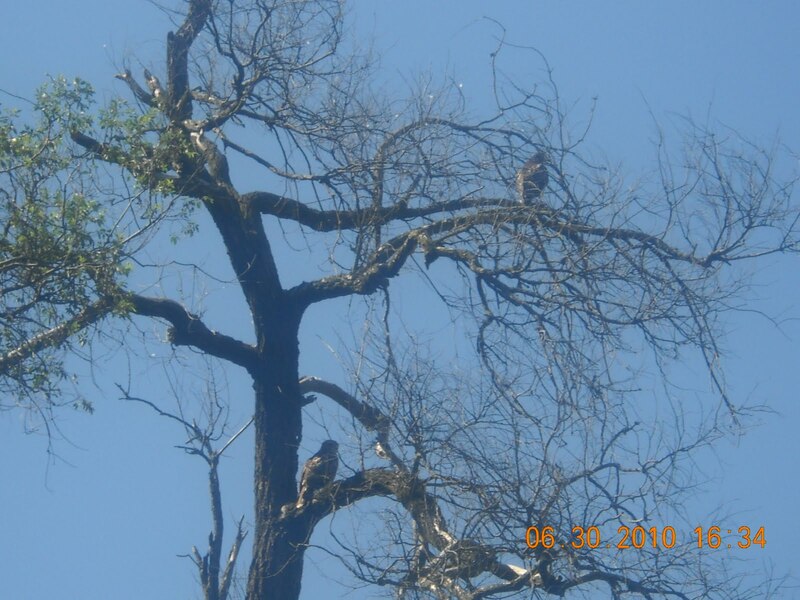 Elvis appears to be on the upper right branch and I think Mom( but could be dad) is down in the middle of the tree next to the trunk. A couple of limbs in the way of Elvis. but you can see him pretty clearly. He's about 1/2 the size of the other bird. 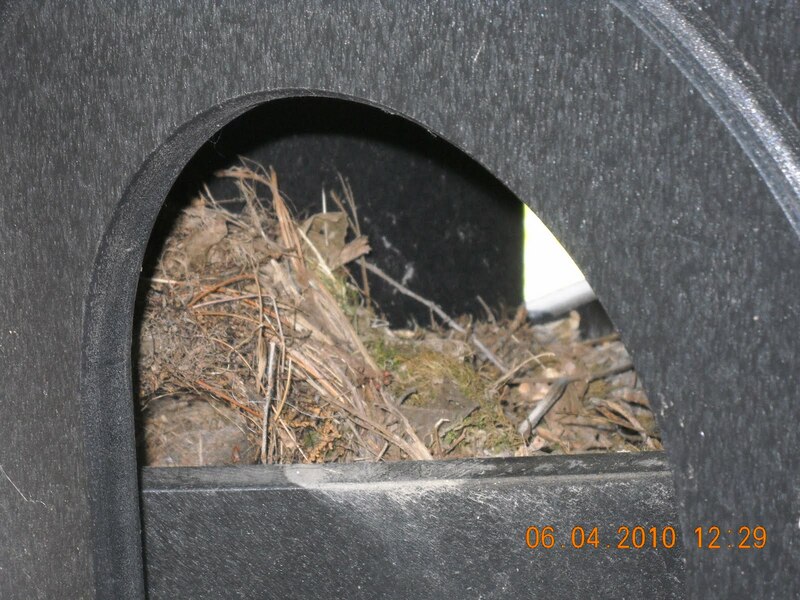 Keep your eyes out around #1 green because that seems to be there favorite perching area. We've been watering the tee excessively over the last few days to keep the turf wet as it is beginning to send down roots into the soil. The fescue is showing some stress from the mid-90's heat but I expect it to bounce back this week as the temperatures moderate. The zoysia has shown very little stress after being laid and is in excellent condition. We have about 25 pieces of fescue sod that we will pick up early in the week to finish off the area next to the red tee and the front of the new tee surround. We have some asphalt patch work to do along the back and the right side of the teeing area this week. We will begin to reduce watering to help firm up the surface in the next few days as the roots become stronger which will then allow us to get a walking mower onto the teeing ground area sometime during the week of July 5th. We are going to take a picture from the Halfway House roof in the next few days which will give you a great overhead view of the new tee. Some of our fairways had some winter damage from cold temperatures and drainage areas which stay wait and will freeze out the warm season turf. Also, some spots were from the bermuda being killed from our bermuda eradication program. This past week after completing the tee work on #8, we had about 400 sq. ft of zoysia sod left from the project and also cut some sod from our zoysia fairway nursery area. 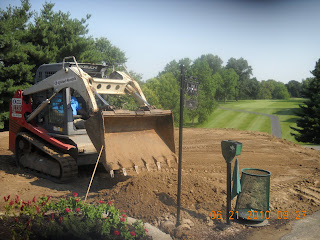 The guys replaced damaged areas on #8 and #3. We have additional areas to repair on #4, 7, 8 and 15 which we will repair this next week. I've delayed any additional bermuda spraying until after the Invitational which is coming up in less than 3 weeks. The zoysia turf is tolerant to our spray but the chemicals do have some regulating affects on the zoysia and delay its growth. 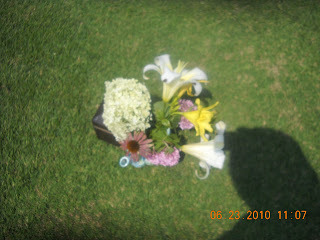 Also temperatures in the mid to upper 90's could lead to additional injury of the zoysia which I did not want to risk. Our spray in April had injured bermuda grass on multiple fairways so I have delayed making a follow up spray. I intended to spray our 4 main fairways in the program in early June but the cool wet weather of mid-May delayed our growth coming out and then the hot weather kicked in in June. Our membership has been very tolerant of the program but sometimes you have to chose green grass over brown and or dead grass. 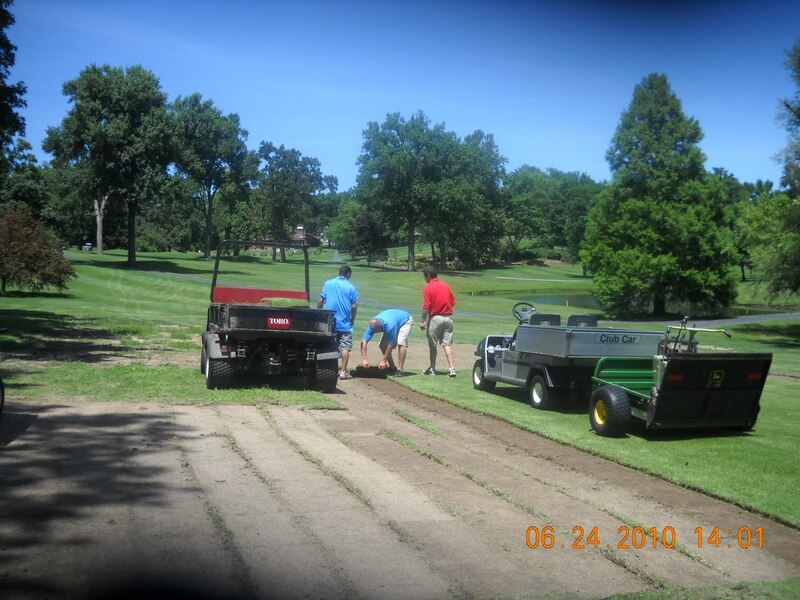 Russ, Tom and Jason picking up sod after it has been cut from our fairway nursery. 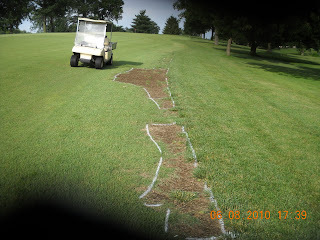 Repairs to #8 near the main road in which the bermuda was killed from our bermuda eradication program. Also, there was some freeze damaged sod at the bottom of the north side of the road on #8 which you can see is now replaced with green sod. 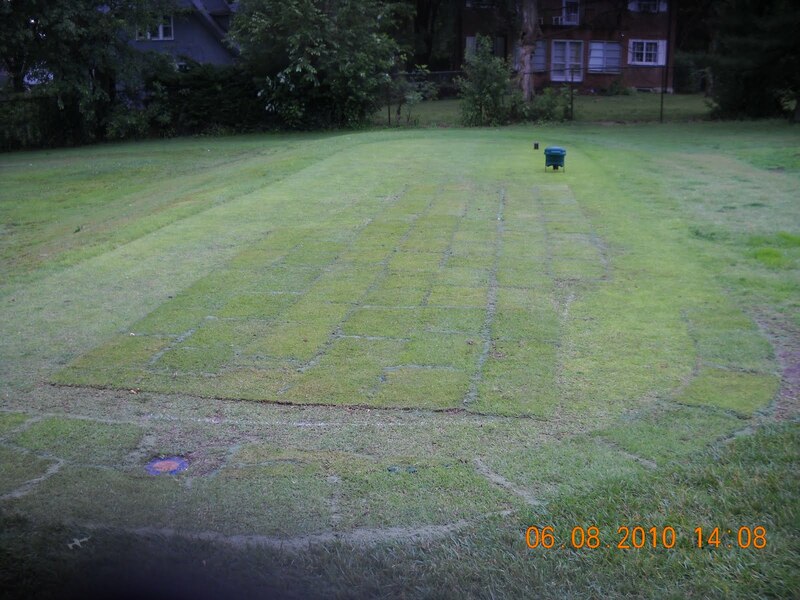 The larger sodded areas are roped off and the smaller areas have white circles around them to remind you to take a free drop from the ground under repair area. This also alerts you to not drive over these areas because we apply excessive water over the spots to keep the sod alive. 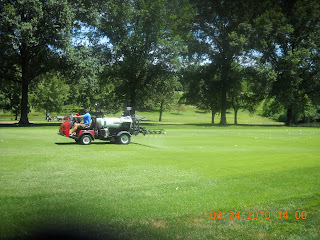 We spray our greens, fairways, tees, green surrounds and 1 pass into the rough with a grub control product each season. 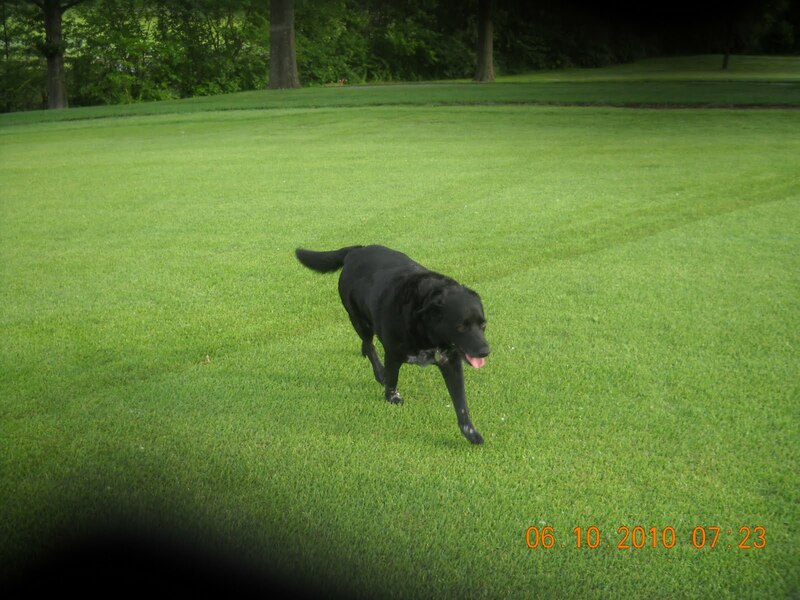 This reduces the impact that various species of grubs can have on our better turf areas. Along with the fairway application, we spray Primo(Plant growth regulator) on our fairways to reduce excessive upward growth which leads to fairways needing to be blown off due to high clipping counts. The regulator also allows the plants to conserve energy and does not reduce lateral growth. 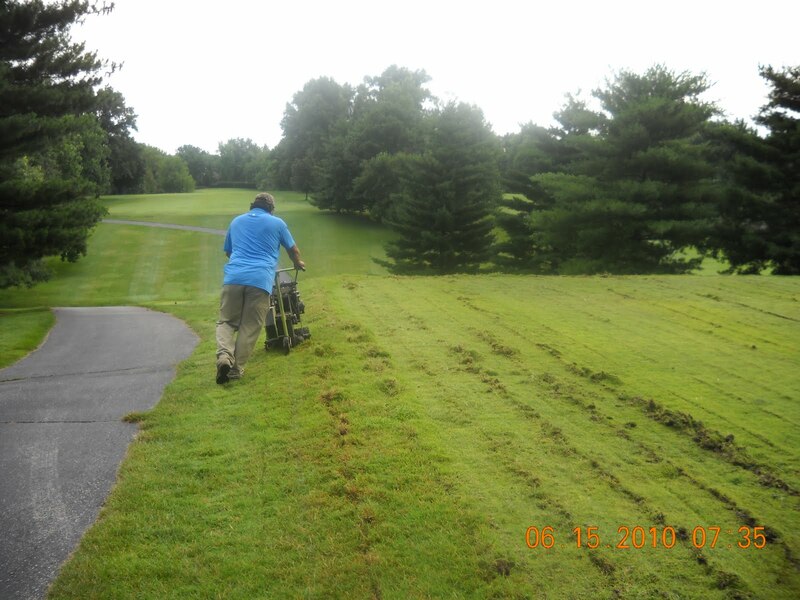 It also keeps the turf at a more consistent height for a longer period of time which provides our members with a more consistent fairway turf and reduces the frequency of mowing which saves energy, wear and tear on equipment and allows us to utilize labor in other areas. Along with the every 3 week primo applications, we also throw some urea fertilizer in the tank to help supplement our fertilizer applications. We will probably make 4-5 applications this summer with our last application being some time after Labor Day. Assistant Mike does our spraying. 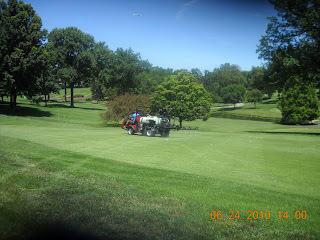 He was on the spray rig most of the day on Thursday and Friday spraying fairways. 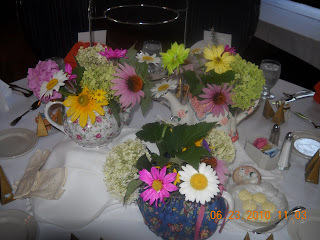 The 9 hole ladies member/guest outing was this past week. 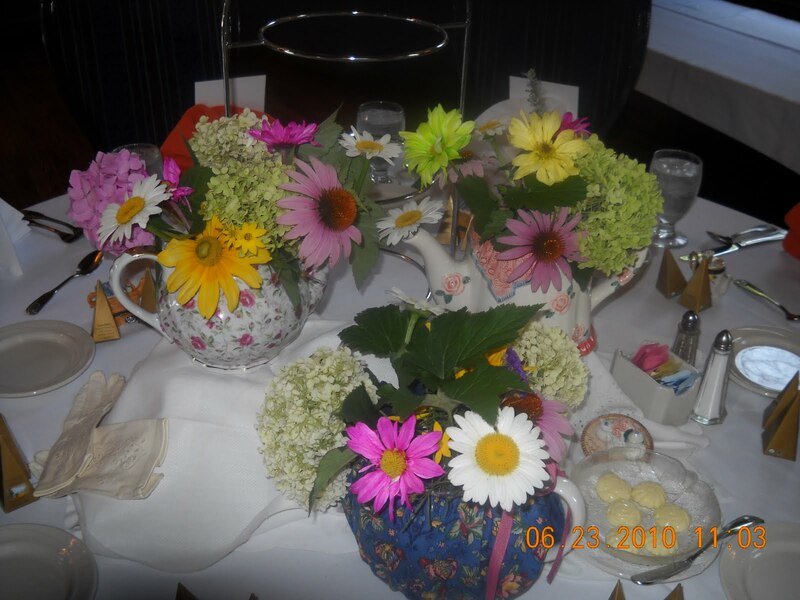 The ladies cut some perennials from property and made some very nice plant arrangements for their tables and tee markers. I think they turned out great! The renovation of 8th teeing ground is complete except for some work next to the red tee, mulching the hole sign and ball washer area and adding some asphalt patch to the cart path on the right side of the tee. The tee has been leveled and sloped to allow for a ball to be struck from any spot on the tee and water will drain off of the tee due to the slope of the surface that was made by the Laser leveling. The only water that comes onto the tee will do so either from rain or a sprinkler that was designed for that purpose. Runoff water from other areas will only go around the new tee. The tee is completely zoysia instead a mixture of bermuda and zoysia. 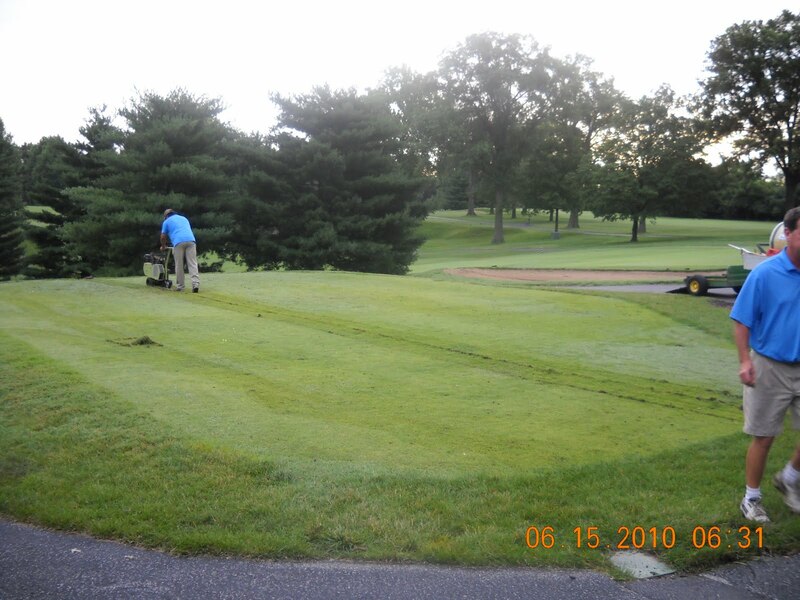 The tee surround can be mowed by automated equipment. Golfers who choose to walk can enter and exit the tee from all four sides. The view from the Halfway House door. An 8" step onto the tee or your can enter the right side of the teeing ground with only a very slight incline to prevent water from entering the teeing area. The view from 10 green surround. Cart operators will need to be aware of the 8" wall that now backs the tee as they leave the area of 10 green. The slope off the front of the tee has been softened to allow for automated equipment to mow the surround plus allow for golfers who walk to exit the front of the tee if they chose. You can also see how level the teeing ground is with the camera being placed at about ground level. 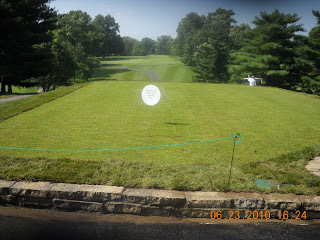 We've placed a couple of signs on the tee reminding everyone to stay off of the tee until we begin to water a little less and the turf has had a chance to take root and has been mowed. Once conditions are right for walking on the tee, we will place another sign inviting you to take a look at the newly renovated 8th tee. This also might be the time that we invite you to hit balls off of the tee as well. The new tee will be ready for play by the Invitational. Great progress today on the new white/blue tee complex on hole #8. The tee was laser leveled and sodded, part of the cool season surround was sodded and the remaining surround will be sodded tomorrow morning after some finish grading off the front of the tee bank and completion of the natural stone curbing/wall which will hold the back of the tee in place. 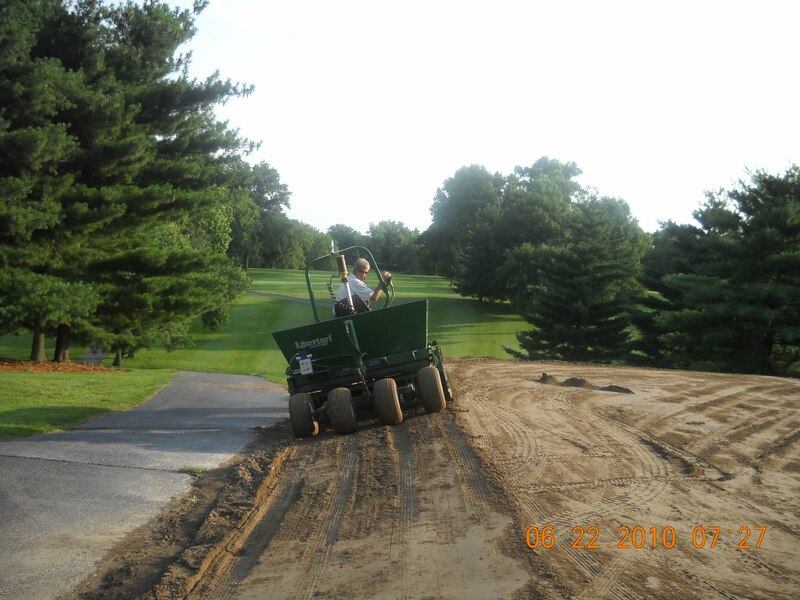 Mike McNeil from Laserturf Leveling which is a part of Schaeffer-Meyer from St. Charles beginning the process of finish grading the tee. Mike continuing to go in circles around the tee. The tractor has a receiver unit that tells the scraper to raise or lower the box depending upon if the slope needs more and or less dirt. Mike is scraping the bank of the tee to smooth out the walk on and walk off areas of the tee. Pretty much all hands on deck after lunch except for a couple of rough mowers. Assistants Mike and Skip, Russ, Tom, Jason, Arian and Ryan all pitching in with the process. We brought in 30 yard rolls of big roll sod which allows sod laying to become a thing of beauty and speed but the tee had areas that were soft and pumping so we rolled the sod out on the side and cut the pieces in 6-8' sections and carried them onto the tee. 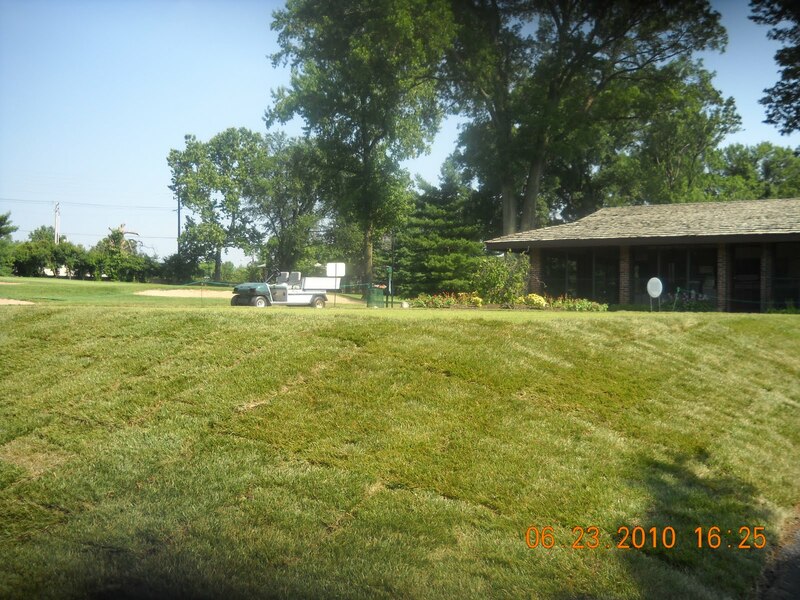 We wanted to use the large roll sod because there are less seems that have to heal and it can be placed into play quicker than normal 3' slabs. The staff started laying the sod at 90 degrees and finished at 95 degrees at 2:30. A tough job. Russ is putting a cooling shot of water on the sod as it was being laid. 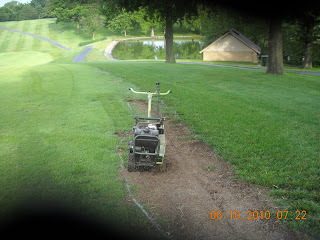 Not too much to create excessive problems for us but enough to bring the sod out of shock. 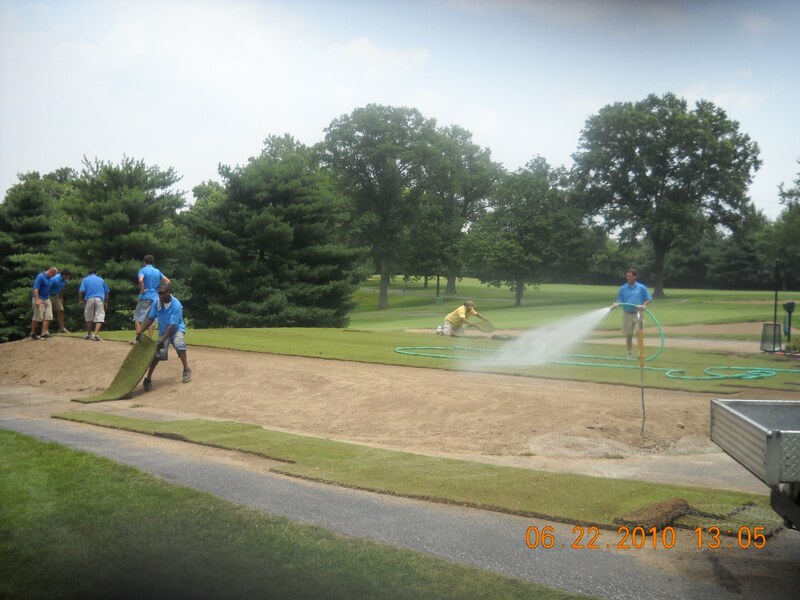 Once the sod was completely laid, we started to give it a good drink of water. It will be kept very moist to wet while it begins to send down roots and begins to grow. It is important that we keep plenty of moisture in the root zone so the turf will be healthy and the tee will open on time. You can see the lengths of sod in the foreground on the cart path after they were cut and are then being hauled out onto the tee. The teeing ground completed covered with zoysia. It looks outstanding. Still some border work to do. 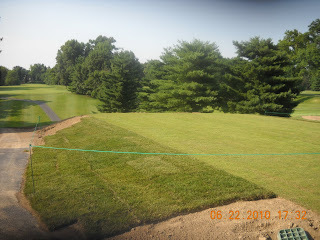 A view of the tee surround cool season turf being placed around the tee. A fully completed tee complex coming tomorrow. From time to time, all of us have felt like Mr. Corleone when we are trying to leave our work for some commitment that was planned or just trying to get home to see the kids or eat supper. 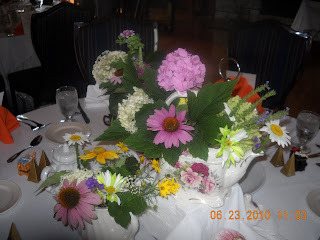 I was preparing to leave the property Saturday afternoon and stopped by the pool to check our newly planted urns to make sure they had enough water. 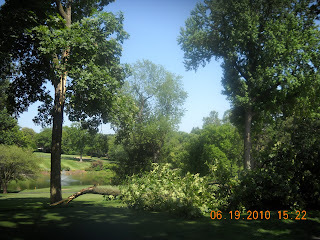 As I was walking over to the pool from the back parking lot, I looked over at 10 blue tee box and saw a large limb lying over the front half of the tee. First, I was pleased that no one was standing on the tee at the time because it was a large limb that could have injured someone. I then looked down the hill from the tee about 50 yards away where approximately 100 chairs were set up for a wedding which was to take place in 2 hours. 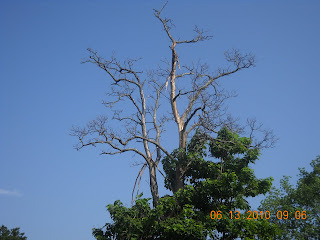 One more thing to do since all the guests would be driving in the main road seeing this large section of tree. 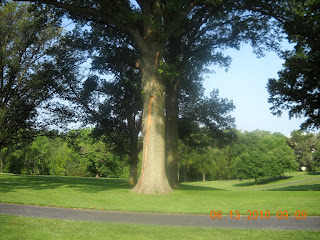 Once they arrived and were seated for the wedding ceremony, they would look up to the beautiful teeing area of #10 and see that monster limb lying on the ground. Chain saw, loader and 4 wheel drive workman and the section of tree was history. It was a hickory tree that appeared to had been weakened by borer damage and was virtually impossible to see the damage until it fell off the tree. The tee side section of the hickory tree lying on the blue tee. Cut up and hauled away. The new fescue/bluegrass green surrounds are working well. The look is great, the playing out of is challenging but there are times where a ball will rest right up against the 2.5" fescue or higher cut and getting a club on the ball is virtually impossible. We are going place a one rotary push mower width intermediate cut around holes, PG, 7, 10, 11, 12, 13, a small part of 17 and 18. These are the greens which had fescue placed around the greens. 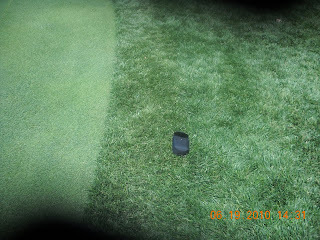 The rest of the holes have warm season around them that is cut by the regular intermediate reel mower at 1.25". We will take the cut down slowly and will try to get it between 1.5 to 2" within the next few months. This should normally be done in the cooler times of the year but if we take our time and not get in too much of the a hurry, we will have some relief for you from the shots that get trapped up against the collar and green surround. My camera case is on the border between the regular 2.5" green surround cut on the right and the 1 push mower width 2" cut. I will try to get it down to about 1.75" over the next couple of weeks as some milder weather pushes in. 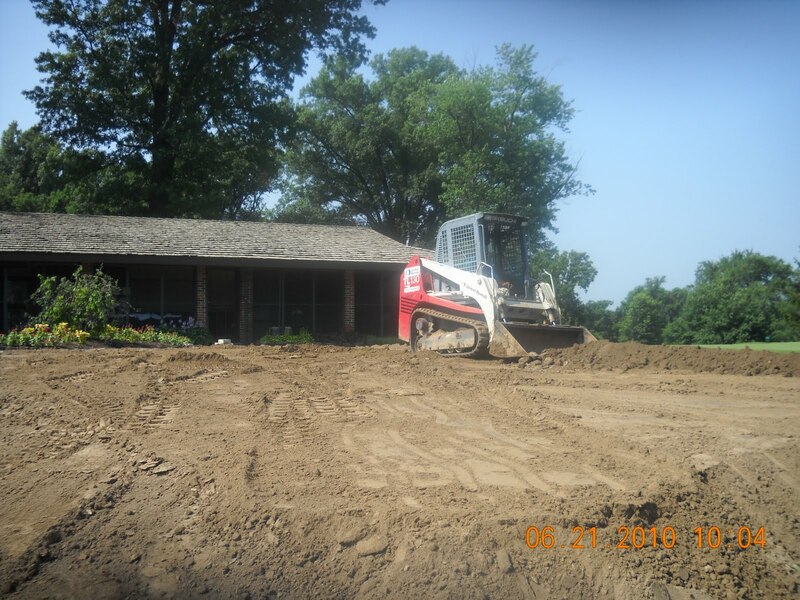 After 3 days of rain in St. Charles county where our dirt was being hauled, we were finally able to make some good progress on Friday. We hauled out 7 tandem truck loads(100 yards approximately) using our single axle dump truck and Skip moved it around with our box blade tractor. The view from the cart path between 7 green toward 8 tee. You can see that the elevation of the tee will be at the existing level of the natural stone wall of the flower bed. The stakes are in place to give us some gradient marks between the wall of the flower bed and the various areas of the tee. The tee will slope from right to left and out the front corner toward the pine trees in the background. Another view from the back of the tee on the left side pointing toward the right front corner. Monday morning before our full field outing that we had on the golf course, we brought a skid steer in with tracks which allowed us to do some additional grading and packing of the soil. Skip is doing the honors. Skip using the bucket to move soil into some tight corners. Another view from the right front corner. How the tee was left at 10:30 before the start of the tournament. Contractor laser leveling the teeing ground first thing in the morning. 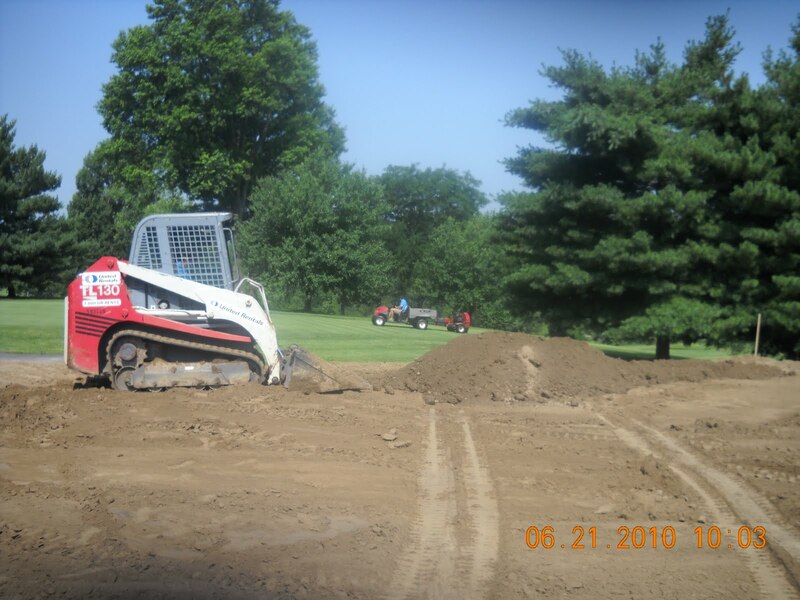 Bring more dirt in for the area between the new tee and the red tee to soften the bank for ease of mowing. Grade and pack the dirt in place for the tee surround. Begin the stacked natural rock curbing/border around the tee after the teeing ground had the proper gradient set. Sod the teeing ground with big roll zoysia sod. Back fill along the new curb and install fescue sod around the border of the zoysia and between the new tee and the red tee. 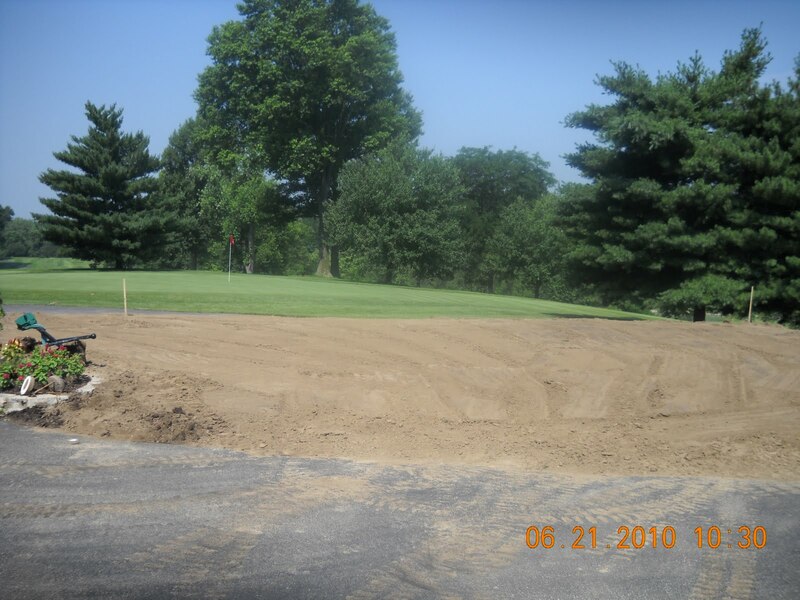 An update on the 8th teeing ground renovation. 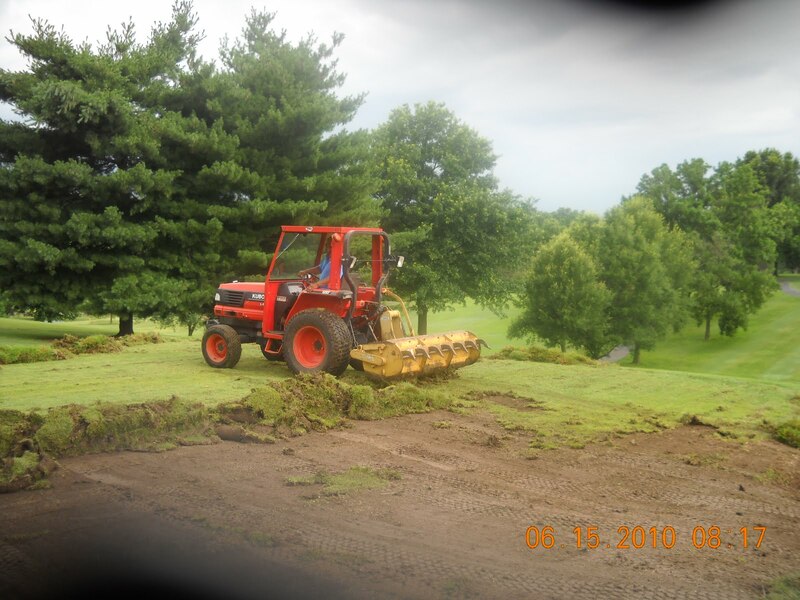 We were able to cut the old sod off of the tee this morning, load it in our dump truck and haul away. 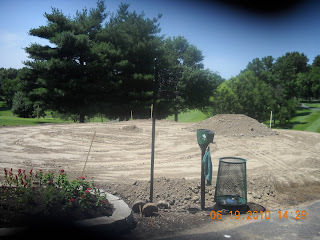 A couple of loads of dirt were hauled in and the dirt was moved around on the tee. There are numerous irrigation heads and valve boxes located on the tee that have to be raised to the new level of the tee. Then the rain came. Skip using the sod cutter to remove the sod. Russ is preparing to dig up some of the irrigation boxes. Skip working his way across the tee. Skip pushing and pulling the sod that has been cut from the tee surface with the tractor and box blade. 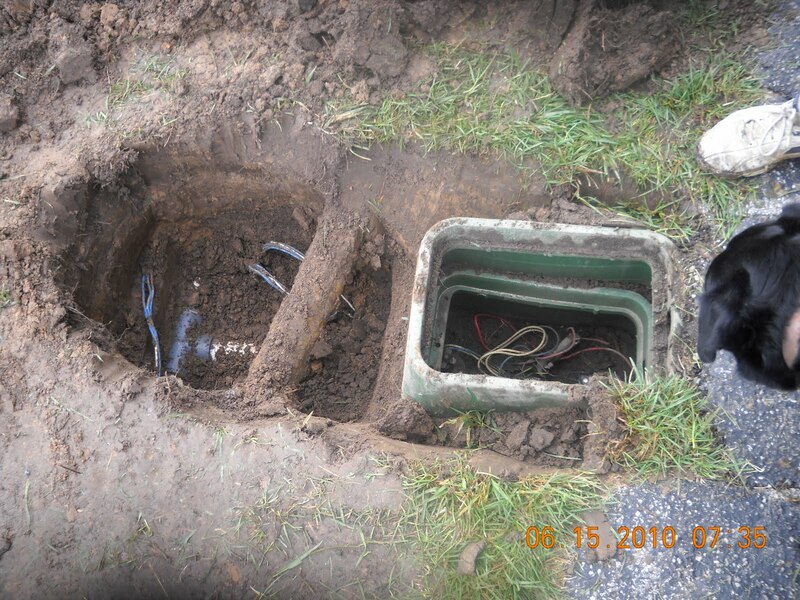 This is the valve box that controls the landscape sprinklers around the Field Bar. The large pipe is the potable water source for the pro shop and maintenance building. 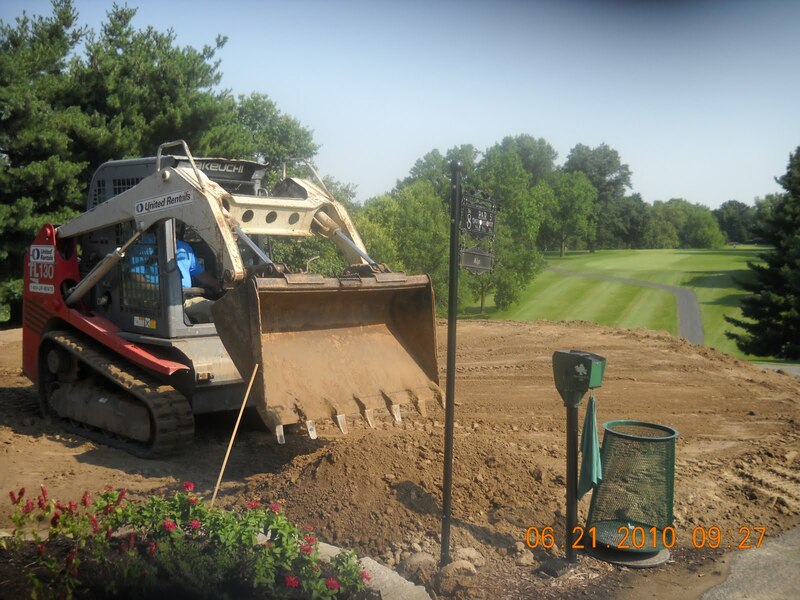 The shut off and valve will need to be moved about 8" to the left so we can place the natural stone curbing along the cart path which will divert the water around the tee box. The valve box will need to be raised to the level of the tee using an extension. Lady always likes to investigate a hole in the ground. She checks out the guys work and gives her approval. 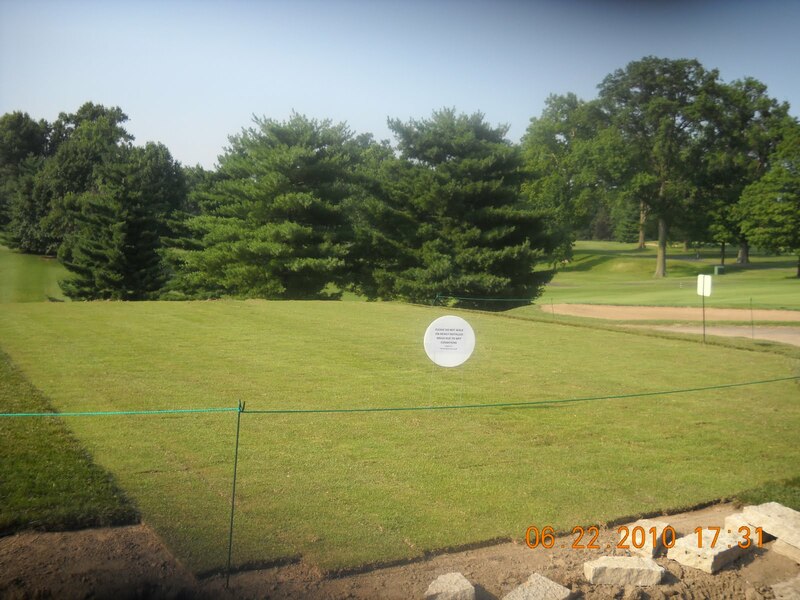 We set up our surveying equipment on the tee to determine the amount of soil needed in any given area. Marks were made on surveying stakes so soil will be raised to the marked line on the stake. 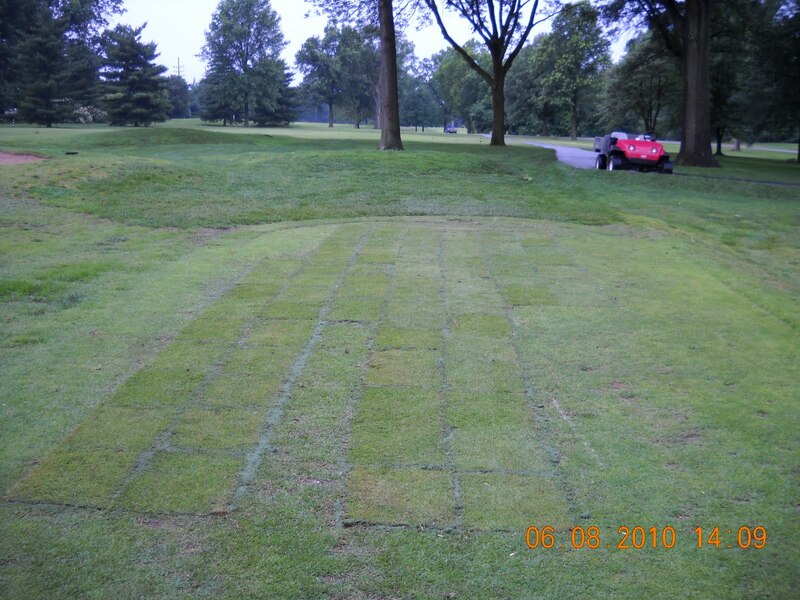 Most tees are sloped from around 3/4 to 1 %. The tee will be rough graded for the laser level to do the finish grading. 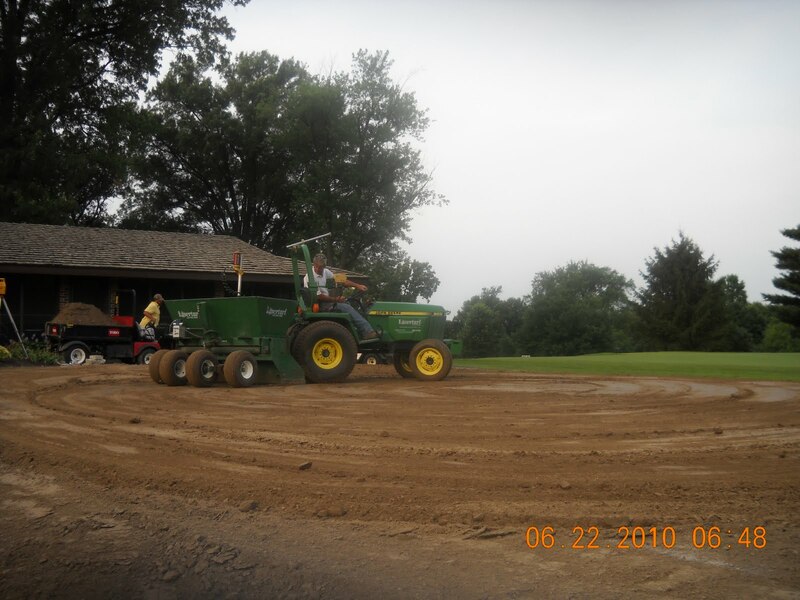 We hauled 2 loads of dirt onto the tee and moved the dirt around before a monsoon hit us. More pictures tomorrow when we begin work on our natural stone curbing which will allow us to raise the level of the tee by about 8" and move the water around the teeing ground. The 8th main tee area is a very difficult tee for us to manage. Water from the roof of the halfway house and from the cart path along the green side of # 7 run onto the teeing ground and keep it constantly wet. The tee can remain water logged for up to 3-4 days after heavy rainfall which limits tee placement and prevents the tee from being mowed. The excess water contributes to bermuda grass contamination which makes up 50% of the teeing surface and leads to serious compaction of the turf. The tee is not level from years of use and the orientation of the tee is into the trees along the right side rough of #8. The tee is also not visually attractive in the high visibility area of the halfway house with 3 greens and another teeing area nearby plus the Halfway house is frequented by many whom are getting a sandwich before or after their round has been completed. 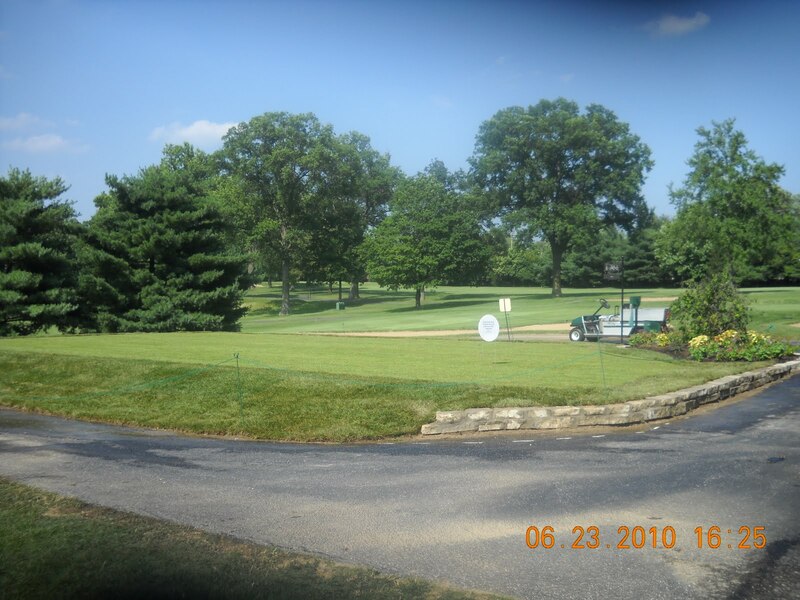 Weather permitting, the tee renovation is scheduled to start on Tuesday, June 15th and will be completed by Friday, June 18th. 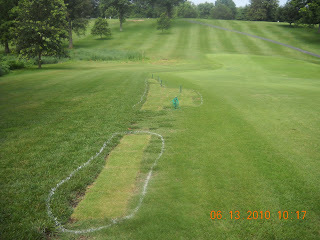 In the interim, the white and blue tees will be moved to the red teeing ground. The new tee will be back in play a week before the Invitational. Once the new tee is back in service, the red tee will require some repair due to its size and the amount of play that it will be handling over the next few weeks. It will be raised slightly and leveled for our red tee players. 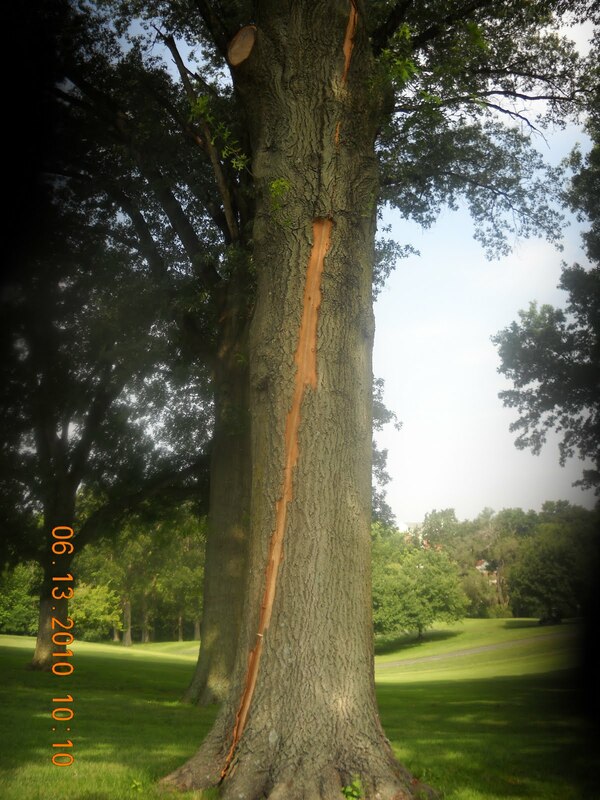 Over the past 3 to 4 days, we have had at least 3 lightning strikes on property. 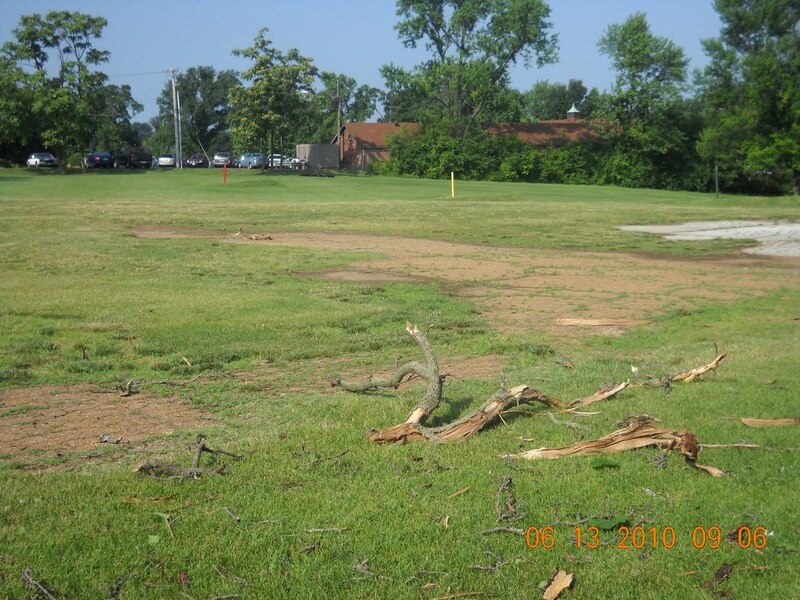 I will display a few pictures of some of the damage but Nash and I felt it would be good to remind our members about the procedures during a halt in play because of too much rain and or lightning. The pro shop has a paid weather service that provides lightning detection on a radar screen. Once the lighting gets within the 8 mile zone on the radar, a horn is sounded manually by the staff for all golfers including workers to come off of the golf course. The staff will drive out away from the pro shop to sound the horn again for any golfers that are on the corner of the property. Golfers can either go to the Field Bar(Halfway House) or the pro shop for shelter. Once lightning has cleared the area, players will be notified either verbally or through the sound of another horn that play may resume. If you are at the Field Bar, it would probably be wise to go into the structure and not park your cart underneath tall trees and remain in the cart. All practice must stop as well including both ranges and the putting green. The top of the 1/2 dead Catalpa tree on the short range took a direct hit yesterday. 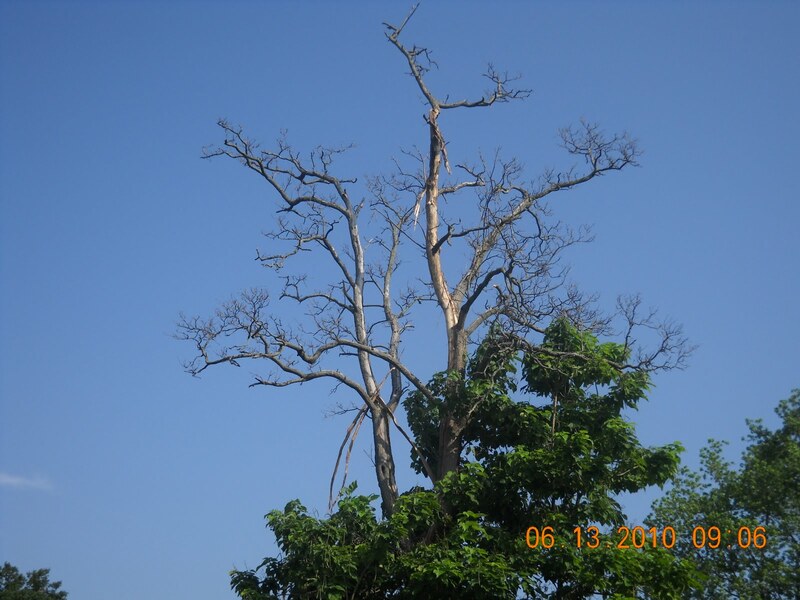 This tree is on our Tree Management list for removal this winter. You can see pieces of the tree were blown 30 yards away from the tree. I had left yesterday afternoon and had to make a cat food run to Petsmart. While doing my shopping, Nash called and said there was a head running between #17/18. I figured it had to be a lightning strike which cause a sprinkler head wiring to short out and turn on. I got back to the facility and we got the water off and then found our second lightning strike. A beautiful large healthy Red Oak beside 17 cart path took a direct hit. Here is a closer view of the damage. I was standing out in the middle of the fairway taking this picture. You can see a piece of wood to the lower left of the date stamp. It was probably 40 yards from the tree. We also believe our clubhouse took a direct hit this week. Tiles from the roof were blown off onto the patio area. As some of you are aware, it knocked out a transformer that helped to power the swimming pool pumps. In the end, lightning is dangerous business. Please do not put yourself in jeopardy once the horn has sounded to come in. 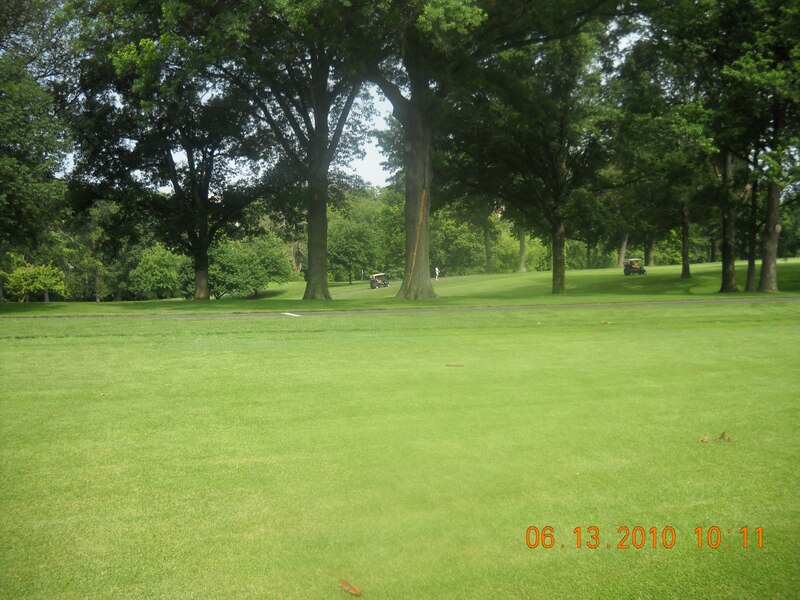 Mark your spot, pick up your ball and you will have time to resume play once it is safe to do so. Lightning does not usually give second chances. Here is a link to a story about a lightning strike at the U.S. Open in 1991 which killed one person and injured several others. Beginning repairs on some zoysia areas of fairways. Some of these areas have been killed by our bermuda eradication program and some of the spots in low drainage areas were damaged during the winter. 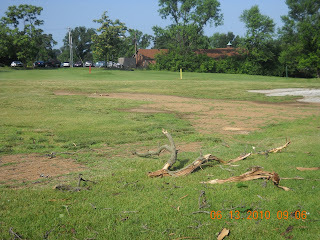 We will probably do a couple of fairway spots each week where we have damage. #3, 4, 5, 7, 8, 10,12,15. An area on the right side of #13 intermediate that has died from our spray program. We ran the sod cutter through the dead material. The dead material in shoveled into a cart and hauled away. 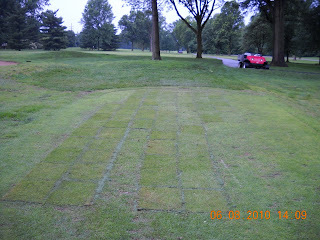 Sod is cut from our range nursery and laid in the area. 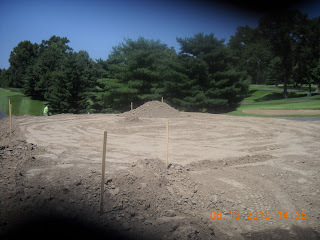 The sod is watered heavily for a few days and we mark it as ground under repair with a white circle to alert our equipment operators and golf cart drivers of the location of the various repaired spots. 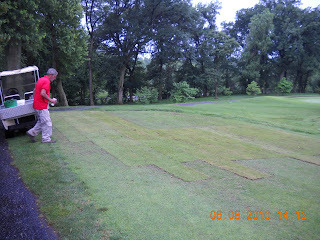 It will take about 10 days or so for the sod begin to heal and the roots to become active. We then do some topdressing of the areas and fill the cracks in the sod with sand to improve playability and help the sod to fill in much faster. The picture below is on the left side of #13. Pictured is our beast of a sod cutter. I can't forget the cameo shot of 'Lady' every once in a while. 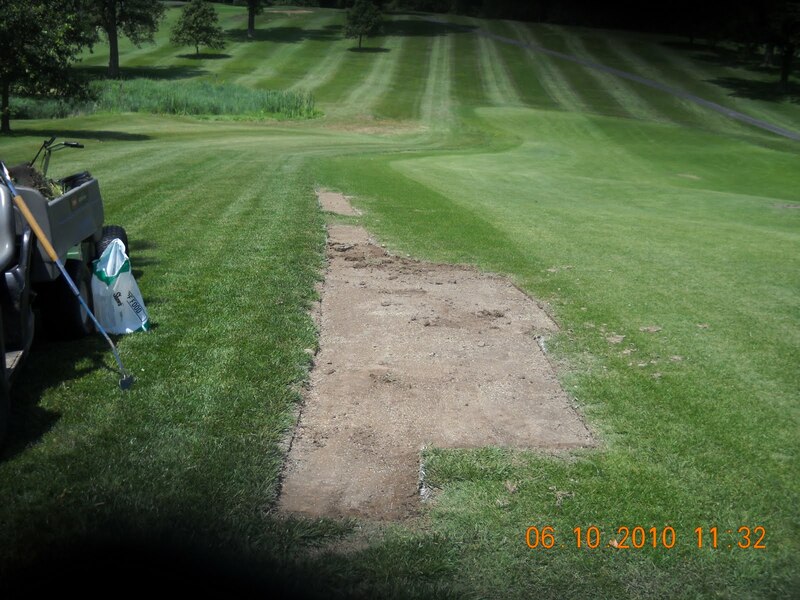 The completed removal of the old, dead material and laying of the new sod. The single line of sod we did not put rope and stakes up but the double or triple row we put up some rope to protect the sod from being driven on or carts turning on the sod which can pull it up. 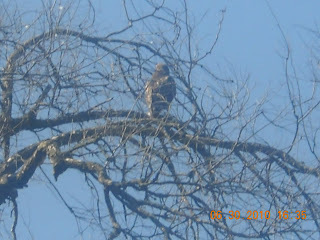 Jim Healey took this picture the other day of our baby hawk on #18. It appears there is only 1 unless others are out of sight. Momma is off to the left minding the store. 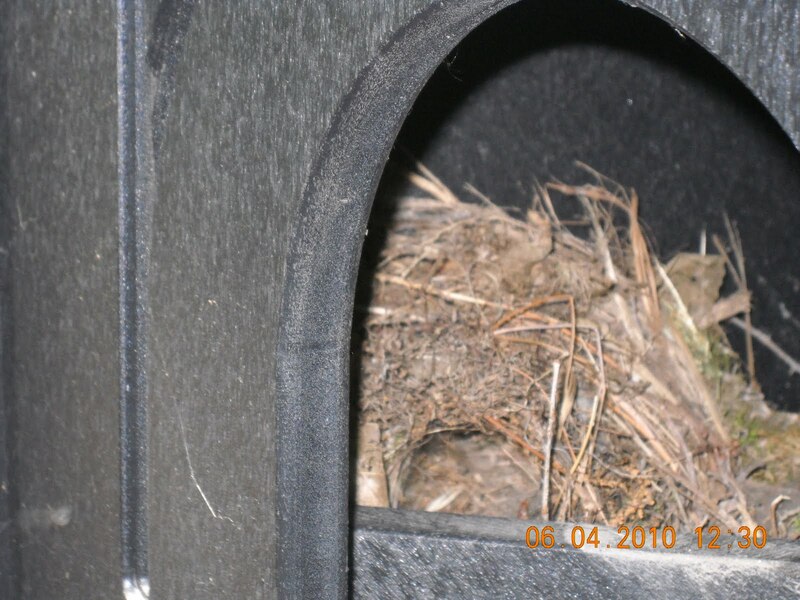 Wildlife use the strangest places from time to time to raise their young. Case in point our local wren population. The boys were changing water coolers at the long range one day when they said something was pecking their hand when they were checking the water. Come to find out a wren had built a nest to the side of the front of the cooler stand and was flying in and out of the opening where you fill your cup with water. As you might have noticed, we've placed another water stand next to the wren's stand to allow her to fledge her young. Wren nest made up of moss, twigs and grass. 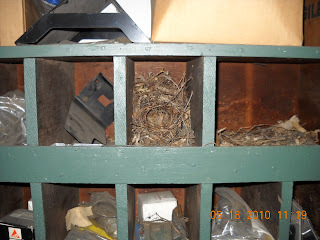 Just a few weeks before, a family of four were fledged out of one of our parts bins in our mechanic room. It was up above eye level and did not realize it was there until baby birds were leaving the nest and trying to get outside. 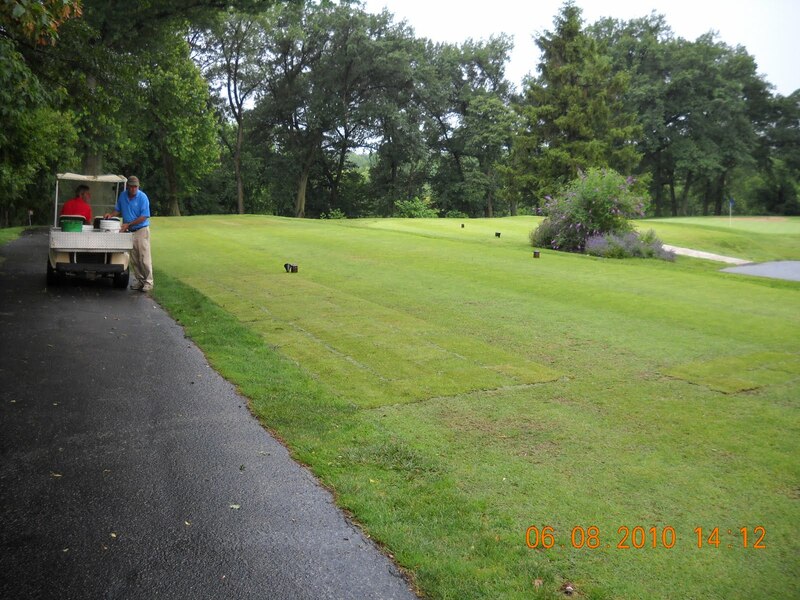 The staff replaced the damaged zoysia sod from the blue tees on holes #6 and #12 yesterday. 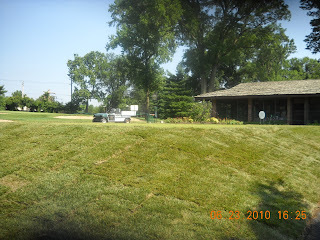 The damaged areas were stripped out with and sod cutter and sod was cut from our zoysia sod nursery between hole #16/10. Assistant Skip, Russ and Tom L. began the job and Assistant Mike, Tom M. and Arian jumped in and helped finish the job before the rain set in at noon. The left side of the 6th tee. The view looking back the other direction. Tom M. is preparing to fill the cracks of the sod with green sand. We stripped in a small section on #4 tee as well which had some damage as well. 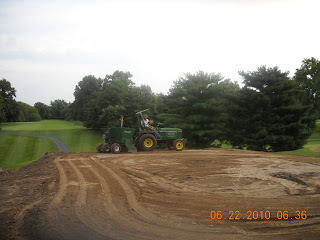 Nick is beginning to fill the cracks in the new sod on #12 blue tee with green sand. The sand helps the turf hold its moisture along the seams and allows the turf to grow through the sand and speeds up the recovery of the turf and helps to make the playing surface smooth. I spent the late afternoon/early evening out on the golf course marking some areas for zoysia sod replacement over the next few days/weeks. Most of the areas were weakened by our bermuda eradication treatments over the past year but some areas were caused by cold weather we experienced this past winter. The picture below is along the right side intermediate of Hole #13. We will be making some spot treatments of our bermuda eradication spray over the next week to reduce some bermuda encroachment of on holes #4, 7, 8 and 13 which are trying to regenerate from earlier applications. These four holes have been in the program since the fall of 2008. We will also do some spot treatment on some bermuda zoysia areas that have an abundance of zoysia in the spot so we are not facing large patches of dead and or dying turf going into the middle of summer. 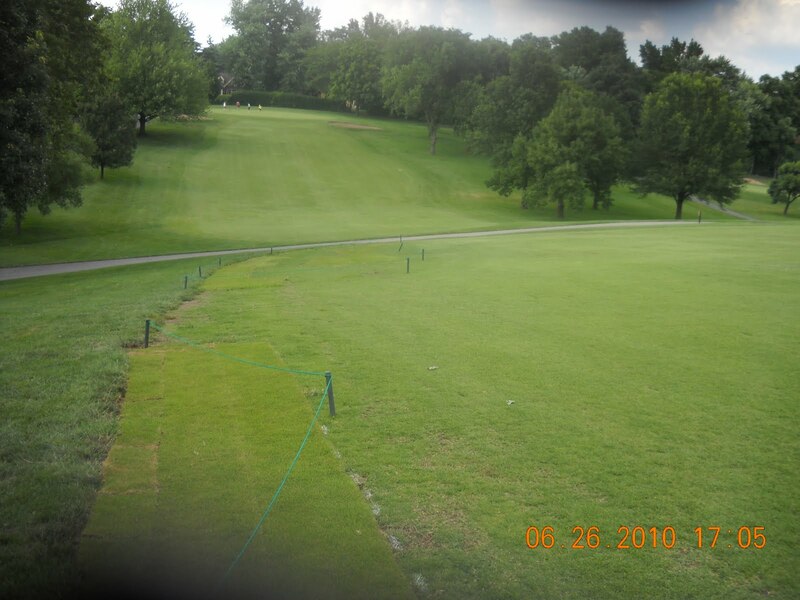 Ty McClellan who is our USGA Mid-Continent agronomist sent out a letter regarding some zoysia decline he was seeing in the St. Louis area. 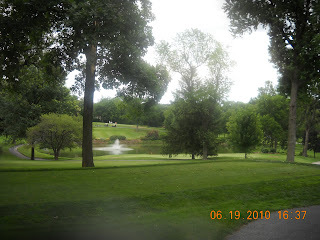 Most of this was occurring on public facilities that allow winter cart traffic but some of the information discussed also can applied to private clubs like Glen Echo.